Please start now by opening PTGui. First we will only use the first 4 images. For further processing the images, we need to rotate them to portrait mode. 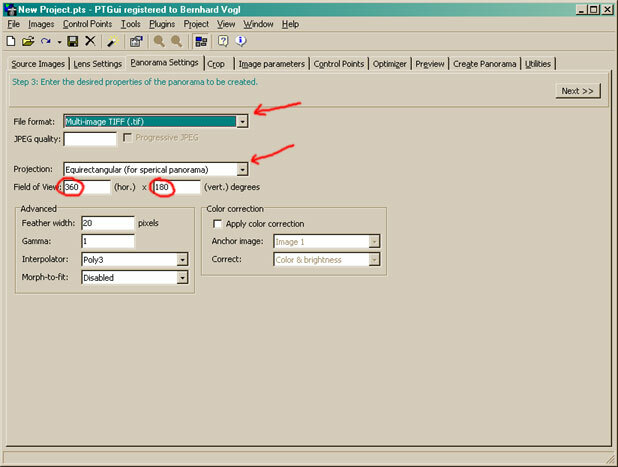 A simple method is to use the "PTGui Project Wizard" with the following settings: "360 degree single row panorama", 2 steps ahead use the button "Rotate Counterclockwise". Afterwards click "cancel" to abort. Go to the tab "Lens Settings". The Lens Type is "Circular".-> Using a recent version of PTGui you will already have this Lens Type. You will notice that now only the "Horizontal Field of View" can be entered. A simple and sufficient value could be 180. All other settings will be left at the default values. 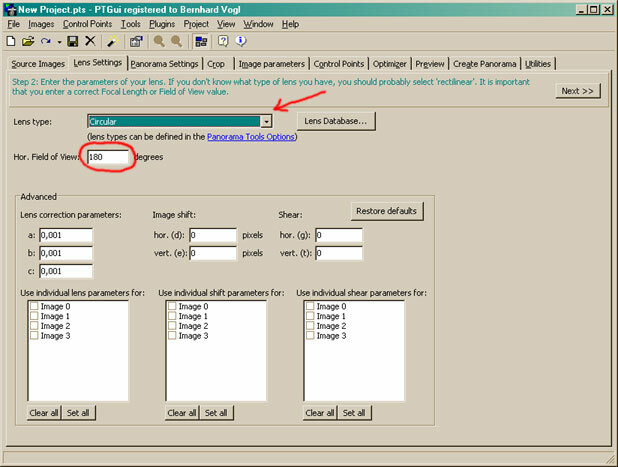 Now click on the tab "Panorama Setting"
We will need the File-Format "Multi-Image TIFF" for later use of enblend. Don't worry about the black edges. You can remove them by clicking on the "Crop"-tab. 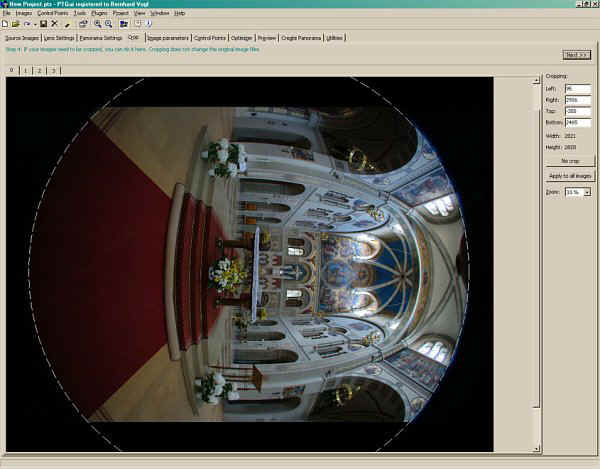 Cropping the image is helpful for visualizing the panorama in the editor window but it is not really needed. In fact there are some disadvantages to cropping the image: The creation of the panorama will take more time and full 16bit images are silently downgraded to 8bit color depth (at least in our case, where the crop circle leaves the image boundaries). 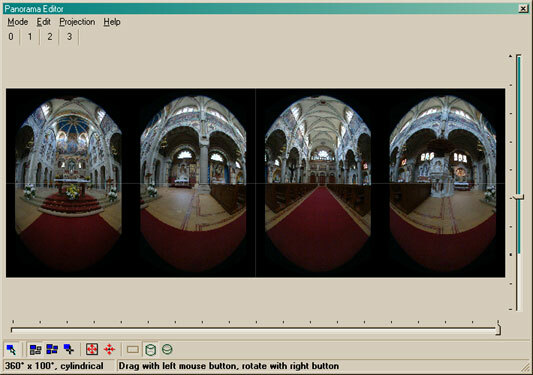 We will now use the external tool "Autopano" to automagically create some control points for our panorama. Finding the "right" options for Autopano depends heavily on the way you take your images and the scene itself. If you want to know further details about choosing parameters you may follow the discussions at the Panotools-List where i also thankfully got some good tips for parameter combination. In my example images you will notice a very special problem: there are quite many wrong control points. This is due the nature of the scene, having many recurring ornaments. 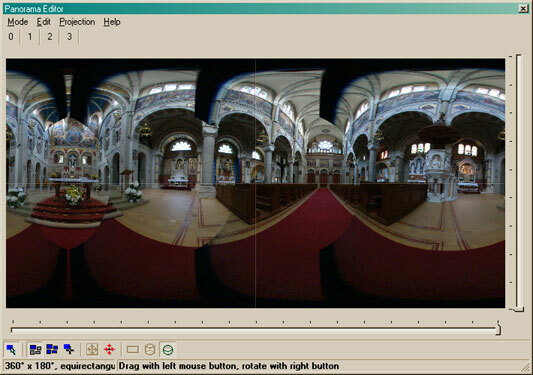 Now start Autopano through the Menu "Plugins"